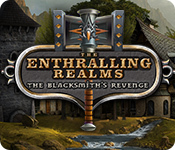 The Enthralling Realms: The Blacksmith's Revenge is rated 2.7 out of 5 by 10. Rated 5 out of 5 by XFreak from Another great game from the series Really love how the story presented. The atmosphere of this game hooked me to play and more play. Relaxing gameplay and music. But there is no special about gameplay, its just an ordinary match-3 game. Rated 4 out of 5 by Boomer47 from Relaxing Fun Game A charming little match 3 game. There is a story line and characters who appear. The graphics are bright and clear. There are awards and challenges. Pretty much a basic match 3 game, not very difficult but still fun and relaxing. 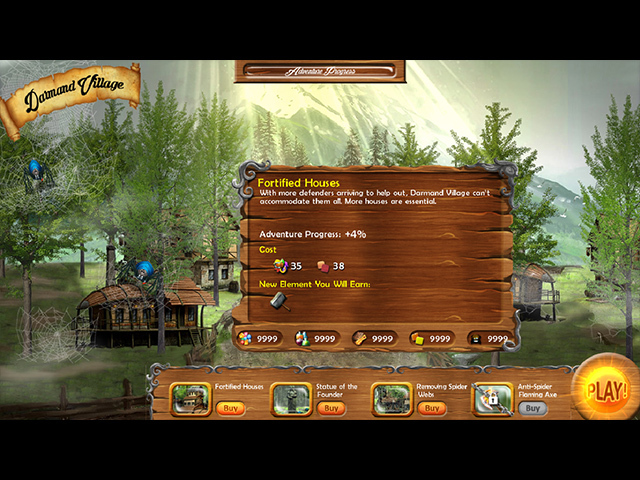 Rated 2 out of 5 by cowclaudia from Monotonous I was hoping for something different with this game since I love medieval scenes and building but after three levels was half asleep. Graphics were blah, dialogue rather moronic, little village kid unnecessary and the gems just melted into the framework making it difficult to make them out, not to mention pretty much the same music as the previous no-so-Enthralling games. As you progress you have to accumulate more and more cash to purchase anything and after awhile was so bored I was paralyzed which isn't the purpose of games. Won't be buying anymore of these! Rated 2 out of 5 by SixSigma from Too Relaxing I am not sure why I bought this game. No timed mode, no limited moves, no challenge. Rated 2 out of 5 by Redau from I was looking forward to a Medieval game but alas; The voices don't work for me in this game, hearing 21st Century and not Medieval so the games environment was sadly spoilt for me on this point alone. I really need go no further "badgerfann" says and feels how I also felt about this game and I take my hat off to this player, as I didn't get that far - Oh well back to playing what I was playing before trying this game and I am sorry but this one is not a buy for me. Rated 2 out of 5 by karenmusik from I Wasn't Enthralled I started feeling bored right at the start when I couldn't move forward through the dialogue without skipping. It's your basic match 3 game. No extras. No mini-games. Same old music, same old story. I didn't even finish the demo. It's okay, but I think I've been spoiled by much better games. Rated 2 out of 5 by badgerfann from Horrible Graphics Didn't last more than one level on this game. 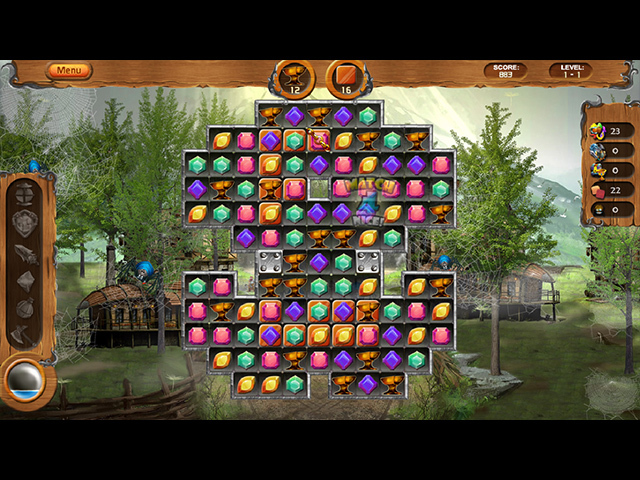 The board is so dark and busy that it is very tough to differentiate between jewels. Color are very muted. 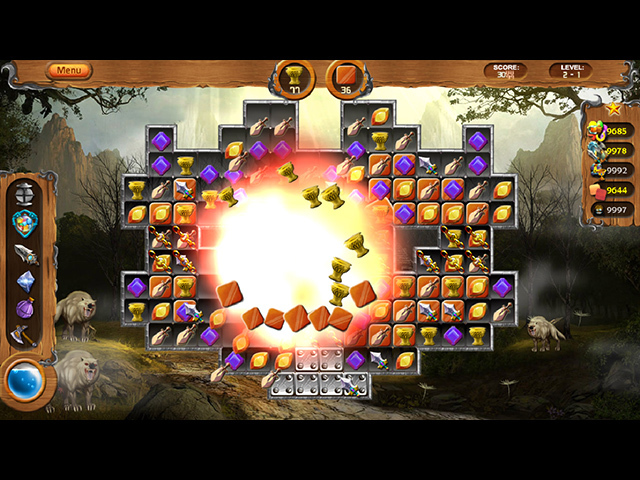 Almost impossible to distinguish what squares are needed to be collected to finish the level. Rated 1 out of 5 by Chigal930 from Boring! Story is blah, the levels are too easy and the effects for making big matches aren't any fun.